Keep yourself cool whether indoor or outdoor. Note: Please open the battery cover and take out the insulator before using the fan, or the fan can’t work. 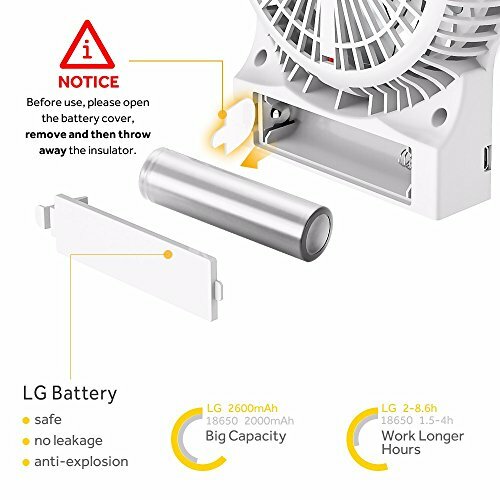 With high capacity rechargeable LG 2600mAh battery, the fan could work 2-8.6 hours with full charge. 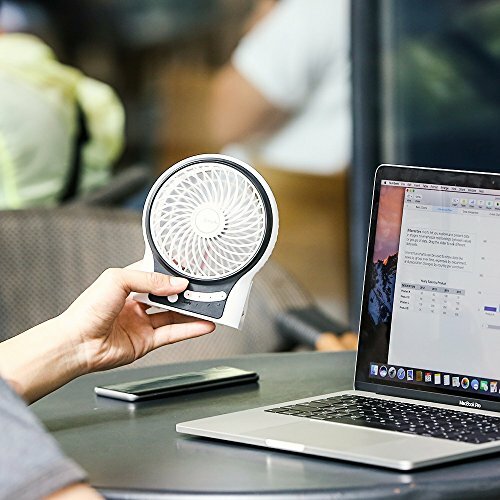 With 1.2m USB charging cable, the fan is compatible with all USB-enabled devices, makes the charging easy and convenient. 4 blades deliver a more focused and average wind. Brushless motor delivers a low-noise cool wind and ensures a longlasting use. 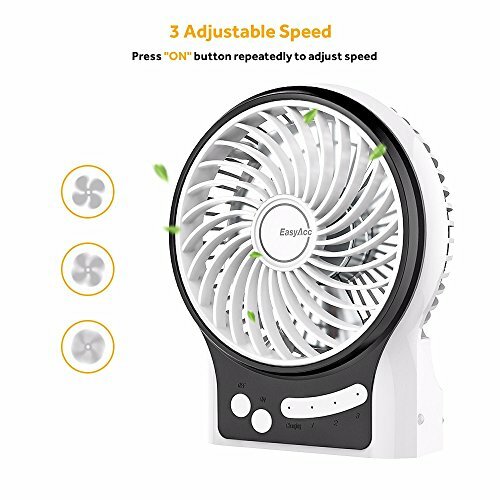 Stable base added with skidproof silica gel keep the fan in its place while using. Indoor: Works on any desktops. With its compact and quiet features, it fits office, bedroom, library, cafe and more. Outdoor: Pack it into your bags, and take it for travel, hiking, barbecue, picnic and more. 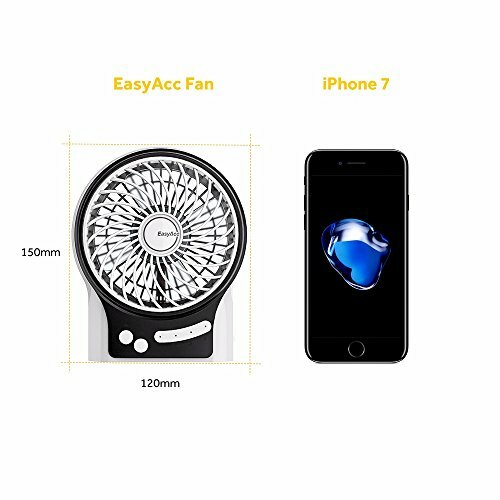 Decoration LED Light: Long press the “ON” button to activate the decoration LED lighting, while the fan is spinning. Brings not only the cool air, but also adds a pop of color for a vision joy. 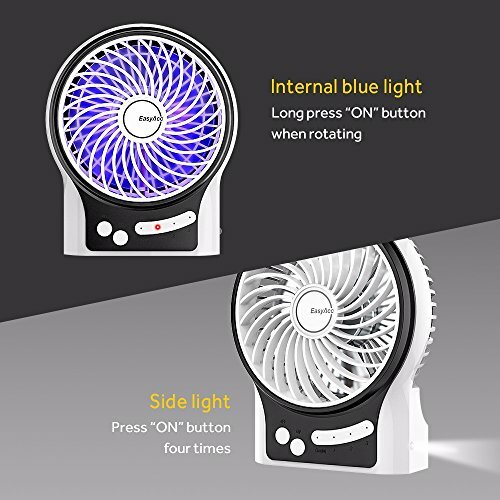 Side LED Lamp: Press the “ON” button for four times to start the LED lamp on the side of the fan. Equipped with a mini torch, offers a handy lighting for low-brightness situations or emergencies. Rechargeable Battery — Premium LG 2600mAh battery ensures 2 to 8.6 hours wireless breeze on a full charge – allows you to take it anywhere you go without cable. Fits both indoor and outdoor. ✔ NOTE — Please open the battery cover and take out the insulator before using the fan, or the fan can’t work. ADJUSTABLE 3 SPEEDS — Meet your cool needs with low, middle and high level speed, at a press. 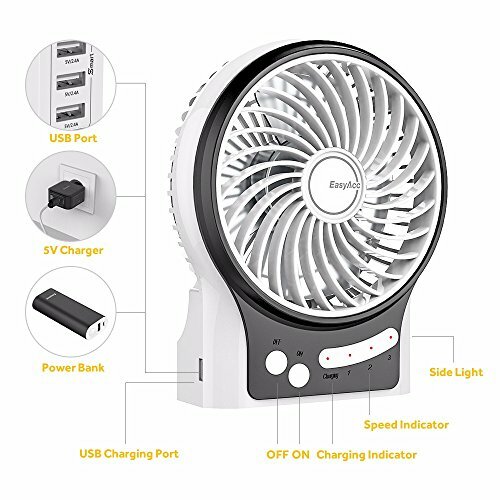 Convenient to Charge —- Apply the supplied USB cable to computers, power banks, chargers and other power supply with USB output. Or just use the battery power supply. Unique LED Lighting — A pair of LED equipped in the fan casts a beautiful decoration light, while spinning. And the side LED lamp gives right amount of light for emergencies. 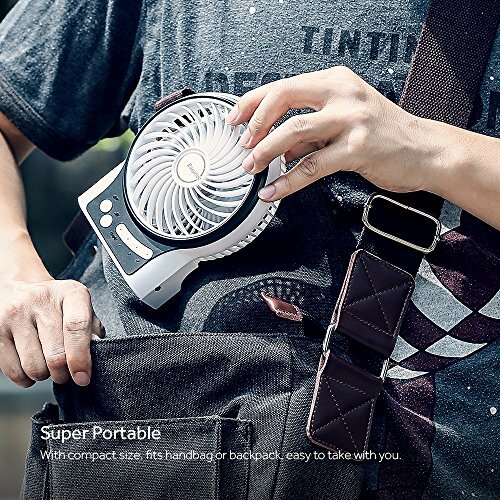 Portable Fan — Made rather compact, it fits your bags, purses and more. 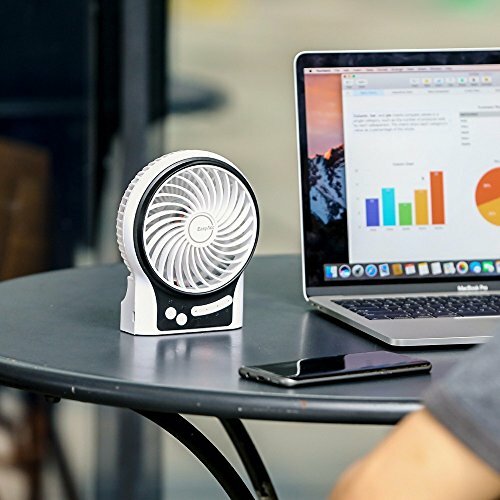 Perfect for trips, hiking, barbecue outdoors, and a great desktop fan for office, bedroom and more.